After your lobectomy, you will go through a recovery period in the hospital and then at home. During this period you will be weaned from the ventilator, have your chest tube removed, and begin to resume eating and drinking. What can you expect when your surgery is over? What happens in the hospital, and in the days and weeks after you go home? 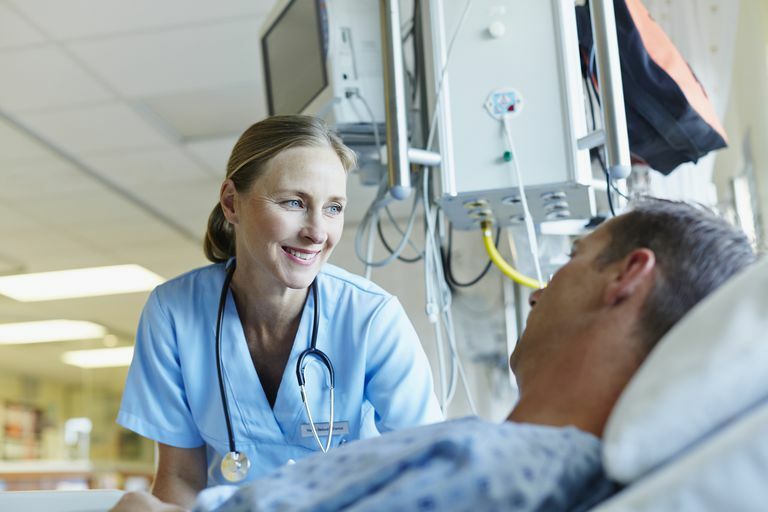 Here, we are discussing your recovery after your lobectomy, but you may wish to learn more about the types of lobectomy, what the procedure is like, and the potential lobectomy complications and prognosis before your surgery. Before you have your lobectomy surgery you will probably wonder what your recovery will be like. Here's a general timeline of events that may help. When your surgery is complete, you will be taken to the recovery room where you will be monitored closely for several hours. A chest X-ray may be taken, and vital signs (such as heart rate and oxygen saturation) will be monitored until you are deemed safe to transfer. For the first day or so you may be monitored in the intensive care unit (ICU). The ICU is designed to take care of people who are very ill and are less focused on the needs of family and friends. Flowers are not usually allowed, and many people are limited to only a visitor or two at a time. Some physicians suggest that you limit visitors during this time to close friends and family, and encourage others to visit after you've been transferred to a regular hospital ward. The breathing tube that allowed the ventilator to breathe for you during surgery is sometimes left in place while you are in recovery. Since this can cause some anxiety, you will be given medications that keep you very drowsy until the tube is removed. In most cases, the breathing tube can be removed on the same day as your surgery. The tube may be kept in place longer if a larger portion of the lung was removed or you have a chronic lung condition such as COPD. This does not necessarily mean that you are having complications. In most cases, it is simply that your lung capacity is such that more time is needed before you can breathe on your own. When the ventilator is removed and you become less sleepy, a respiratory therapist will ask you to cough and assist you in the use of an incentive spirometer. This is a device that you breathe into to exercise your lungs and helps to keep the small air sacs (alveoli) in your lungs open. When you are able, the nursing staff will help you sit, and then encourage you to get up and walk with assistance. You may not feel like being active, but increasing activity will help you regain your strength more quickly and reduce the risk of developing blood clots. It's helpful to learn about how to prevent and recognize blood clots before your surgery, since these are not uncommon after lung cancer surgery, or even with lung cancer when surgery is not done. A chest tube will be kept in place until the surgeon is confident that the drainage has stopped and no air is leaking. The removal usually occurs three to four days after your surgery but may take longer if the surgery was extensive. Again, this does not mean your recovery is going poorly if the chest tube needs to be left in place longer than the average amount of time. Instead, surgeons wish to be cautious, and it's easier all the way around to leave a tube in place a little longer than to have to reinsert a tube. The length of your hospital stay can also vary by your age, health status, your response to post-operative care, and the type of surgery you had. Generally speaking, people will spend at least five to seven days in hospital following an open lobectomy and three to four days following a video-assisted thoracoscopic surgery (VATS). Many people are anxious to get out of the hospital and return to their own bed, only to realize that perhaps they shouldn't have been so anxious to leave. Trust that your surgeon will understand when it's a good time to take those steps out of the hospital. Returning to your usual lifestyle can be a little frustrating following lung cancer surgery—especially if you were not having a lot of symptoms from your lung cancer prior to the procedure. Some people have found that it helps to notice progress every day—such as having tubes progressively removed. Focusing on the small steps forward rather than expecting yourself to be "back to normal" can be calming. Even if you were fit and in good health prior to your surgery, healing takes time. As you recover, you may notice that the fatigue you experience is unlike fatigue you have coped with previously. Cancer fatigue can be frustrating, especially if you are someone who has a hard time slowing down and taking it easy. Pace yourself when you return home and focus on the activities which take the most mental or physical energy early on in the day. Delegating tasks to others and learning to receive help may not only help you recover faster but ease the helplessness loved ones often feel. While you may be able to return to work in six to eight weeks, your doctor will advise you to avoid heavy lifting for the first several months. This is to prevent strain on the chest muscles and incision. Complication following a lobectomy procedure is not uncommon. Persistent pain referred to as post-thoracotomy pain syndrome can sometimes persist for weeks and months. Even with pulmonary rehabilitation, it can take time to adjust to the reduced lung capacity. These are normal; you simply need to persist with recovery and have patience. On the other hand, there are conditions, such as infections and blood clots, that warrant immediate medical care. It is important to know the symptoms and when it is time to call a doctor. The recovery period after a lobectomy is different for everyone. To aid in your healing, keep practicing your breathing exercises and make an effort to avoid cigarettes (including second-hand some), respiratory infections (such as the cold and flu), and any environmental toxins, chemical fumes, or smoke. Pass, Harvey I. Principles and Practice of Lung Cancer:McArdle, Wi The Official Reference Text of the IASLC. Philadelphia: Wolters Kluwer Health/Lippincott Williams & Wilkins, 2010. Print. Zhang, R., and M. Ferguson. Video-Assisted Versus Open Lobectomy in Patients With Compromised Lung Function: A Literature Review and Meta-Analysis. PLoS One. 2015. 10(7):e0124512.